Kestenbaum and Company’s Spring 2019 auction contains ten Hebrew incunabula and thirty-five important post-incunabula. Many are of distinguished provenance, stemming from such legendary collections as: Sassoon, Schocken, Mehlman, Gradenwitz, Adler-Wineman, Gaster, Valmadonna, Delmonico, London Beth Din, etc. Incunabula are Lot numbers: 31, 39, 55, 57, 59, 67, 72, 73, 79, 81. 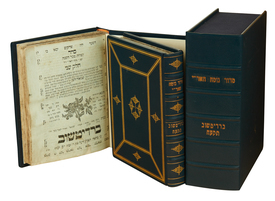 Upon instruction of the District High Court of Tel Aviv and following a break of eighteen months, we continue our series of auctions from an entity that we have designated as “A Singular Collection.” Included here are a further 25 exceptional Biblical and Rabbinic manuscripts, all of which have been thoroughly researched and expertly catalogued by our consultant, the Jerusalem-based scholar, Rabbi Dovid Kamenetsky. This auction also contains the second (and final) disbursement of property from the late Brooklyn-based bookseller and Americana specialist, Yosef Goldman. Of particular note in this regard are the many Autograph Letters and Manuscripts from his private collection, all once again knowledgably catalogued here by our consultant, the independent researcher of American history, Shimon Steinmetz. Elsewhere in the catalogue are Autograph Manuscripts including those by Grace Aguilar, Samson Raphael Hirsch, the Aruch LaNer (see lots 93-96); a most important Chassidic book: The Nusach Ari Siddur, Berditchev 1818 (lot 61); and significant Holocaust-era documents (lots 99-112). An offering of Holy Land travel books and maps round out the sale.